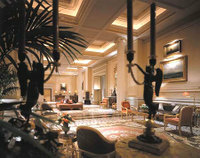 I need to take a moment to tell you about the spectacular, historic hotel where I'm staying for a few days in Athens. The hotel Grande Bretagne is linked in every way with the tumultuous changes that have transformed this country from a dusty outpost of the Ottoman Empire into a modern, independent Greek state. It opened for business, roundabout 1874, in response to the need for luxury accomodations for rich European travellers exploring the origins of Western civilization. (I picked up a fantastic book in Egypt with travel writings from the time, including a list of recommended dos and donts. The writer recommends leaving your maid at home. "No lady who values her peace on the journey, or desires any freedom of mind, or movement, will take a maid," someone named Harriet sagely wrote in 1846. "What can a poor English girl do who must dispense with home-comforts, and endure hardships that she never dreamed of, without the intellectual enjoyments which in her mistress compensates for the inconvenience of Eastern travel?") Happily, by the 1870s, this was resolved, in Greece anyway, with the opening of this hotel. The Grande Bretagne, a seven-floor palace in colonial style, has long been a landmark along Syntagma Square, just beside Parliament, but today it is something even more special. The Greek family that owns the hotel, the Laskiridis, undertook a massive renovation in 2001. The entire hotel was closed for a year and a half, and gutted. It is fair to say no expense was spared to transform the place into the glittering gem it now is, with a rooftop pool, a terrace with a breathtaking view of the Acropolis, antique furniture, heavy silk drapes in the rooms, beautiful linens, towels. I could really go on, but I won't except to say the spa is not to be missed. The family, I am told, sunk $130 million into the renovation, a gesture to luxury and the art of living, rather than a savvy business decision. Beyond all that, the staff is both professional and warm, from the concierge to the security staff, always ready to solve a problem or offer advice. This is one of those rare places that are worth the trip.